Edit smarter, faster and better in Lightroom! Lightroom contains a goldmine of information on your editing behavior and your usage of your cameras and lenses. 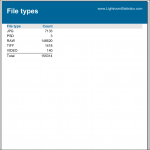 LightroomStatistics is dedicated to exploit all this information to you in an easily accessible way. Assessment – Do you get the most out of Lightroom? Do you use all its possibilities? What are the estimated costs of developing a series of photos? How much time do I spend on developing photos? What develop tools / presets do I use how often? How well are my photos organized? How do I use my camera, bodies and lenses? Special queries section with search queries that are beyond the possibilities within Lightroom. Check out our packages for discount! The table below lists all the reports created for you. Photo history What are the estimated costs of development? How much time do you spend on your images? From import up to this moment, see all the history of the selected photos and the time you spend on them. 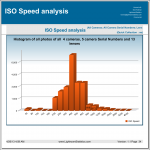 Statistics on the develop time of the selection and individual photos. Develop statistics What are the estimated costs of development? Playback your edit timeline. See what photos you edited yesterday and how long you worked on them. 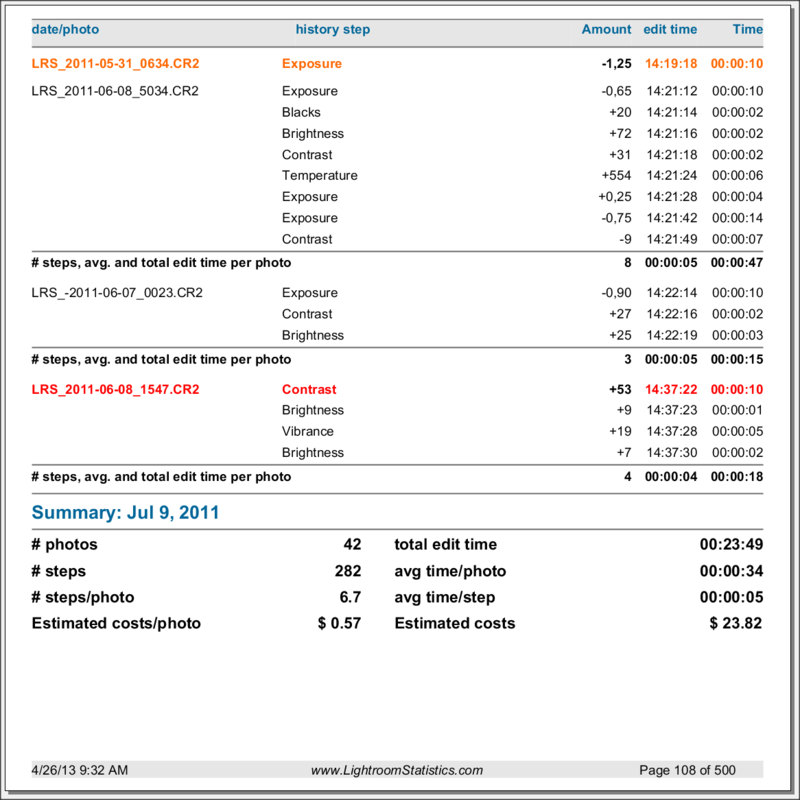 This report shows all the development adjustments in time, with subtotals and statistics for each photo, date and report period. 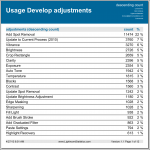 Usage develop adjustment Your adjustments tell who you are. This reports answers the question “what development adjustments do I use and how often”. You can choose between Quick Collection or the whole catalog. 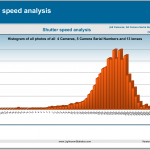 Aperture Buying a new camera or lens or analyzing your camera usage? 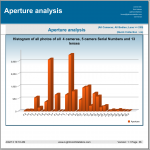 This report contains an in-depth analysis of the of the aperture settings in bar chart and table form for your entire catalog or the photos in your Quick Collection. Drill down from overall catalog / Quick Collection analysis, down to analysis per camera, down to per body, down to per body lens combination. Part of the Analysis Library package. 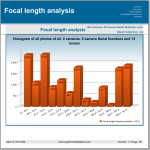 Focal length Same for Focal length. Part of the Analysis Library package. ISO Speed Same for ISO speed. Shutter Speed Same for Shutter speed. Degree of organization Do you miss opportunities? Does it take you a long time to find your photos? How well is your photo collection organized? 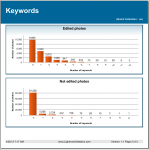 This reports shows your use of Keywords, Stars, Flags and Color labels. It may be an eye opener. Basic analysis of the degree in which you used the organization capabilities of Lightroom. 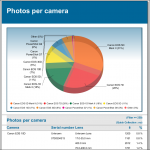 Camera usage The number of photos taken with each of the different combinations of camera, body and lens in pie chart and table listing. You can choose between the photos in your Quick Collection or your whole catalog. (free).Part of the Free reports package. Lens usage Thinking about buying new lenses? 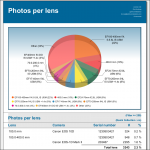 This report lists the number of photos taken with each of the different combinations of lens, camera and body in pie chart and table listing. 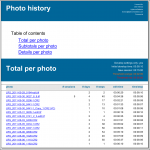 You can choose between the photos in your Quick Collection or your whole catalog. 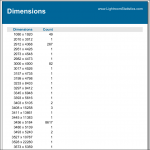 Photos per dimension This free report lists the number of photos of all distinct dimensions, the height and width in pixels. 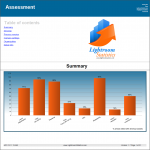 (Free).Part of the Free reports package. 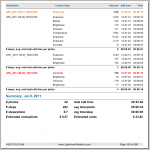 Photos per file type This free reports lists the number of photos of the distinct file types, like JPG, TIFF, CR2, NEF, VIDEO, … (Free).Part of the Free reports package.